Valentino has launched Valentino Donna Rosa Verde, a new flanker to 2015's Valentino Donna. A fresh evolution in the world of Valentino Perfumes: Valentino Donna Rosa Verde steps into the verdant garden of an Italian palace. 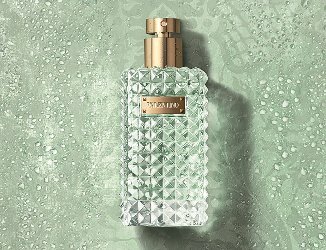 A scent radiating with freshness, captured in a luminous and unexpected collision of notes of green rose, mate tea, bergamot, ginger and magnolia. Valentino Donna Rosa Verde is presented in the iconic Valentino studded glass bottle, a symbol of defiant grace. Valentino Donna Rosa Verde was developed by perfumer Sonia Constant. Additional notes include petitgrain, osmanthus and ambrette seed. Valentino Donna Rosa Verde is available in 125 ml Eau de Toilette. Sounds like a cologne to me with the petit grain and ambrette seed notes.